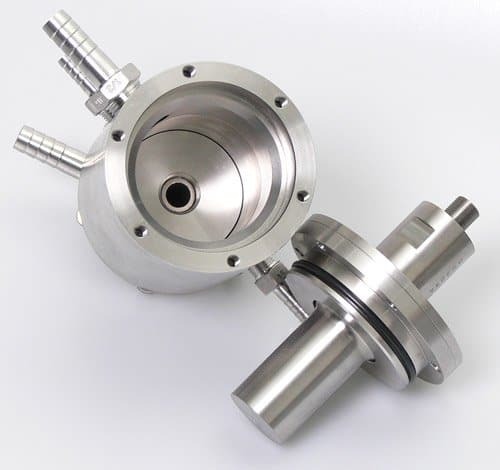 The dispersing and deagglomeration of solids into liquids is an important application of ultrasonic devices. Ultrasonic cavitation generates high shear that breaks particle agglomerates into single dispersed particles. The application of mechanical stress breaks the particle agglomerates apart. Also, liquid is pressed between the particles. Different technologies are commonly used for the dispersing of powders into liquids. This includes high pressure homogenizers, agitator bead mills, impinging jet mills and rotor-stator-mixers. High intensity ultrasonication is an interesting alternative to these technologies. When sonicating liquids the sound waves that propagate into the liquid media result in alternating high-pressure (compression) and low-pressure (rarefaction) cycles. This applies mechanical stress on the attracting electrostatic forces (e.g. van der Waals forces). Ultrasonic cavitation in liquids causes high speed liquid jets of up to 1000km/h (approx. 600mph). Such jets press liquid at high pressure between the particles and separate them from each other. Smaller particles are accelerated with the liquid jets and collide at high speeds. This makes ultrasound an effective means for the dispersing and deagglomeration but also for the milling and fine grinding of micron-size and sub micron-size particles. 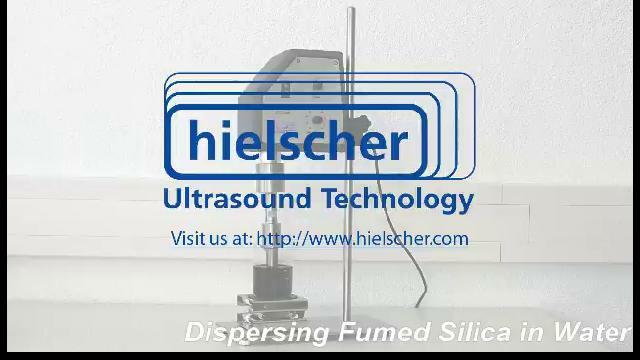 Hielscher offers ultrasonic devices for the dispersing and deagglomeration of any volume for batch or inline processing. Ultrasonic laboratory devices are used for volumes from 1.5mL to approx. 2L. Industrial ultrasonic devices are used in the process development and production for batches from 0.5 to approx 2000L or flow rates from 0.1L to 20m³ per hour. In the table below, you will find general device recommendations depending on the batch volume or flow rate to be processed. Click at the device type to get more information on each device. 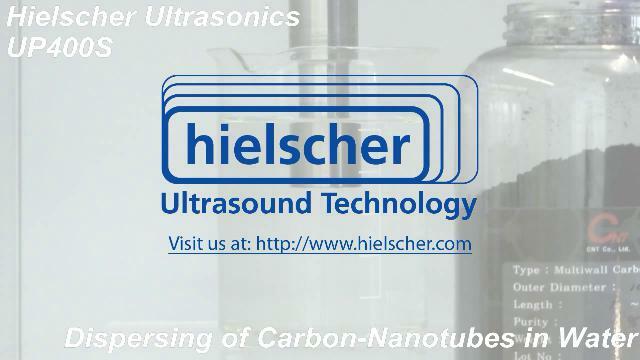 Different from other dispersing technologies, ultrasonication can be scaled up easily from lab to production size. Laboratory tests will allow to select the required equipment size accurately. When used in final scale, the process results are identical to the lab results. Ultrasonic power is transmitted into the liquid by the sonotrode. This is a typically rotary symmetric part, that is machined from solid Titanium. This is also the only moving/vibrating wetted part. It is the only part, that is subject to wear and it can be easily replaced within minutes. 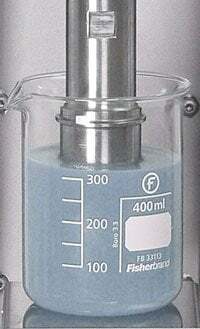 Oscillation-decoupling flanges allow to mount the sonotrode into open or closed pressurizable containers or flow cells in any orientation. No bearings are needed. All other wetted parts are generally made of stainless steel. Flow cell reactors have simple geometries and can easily be disassembled and wiped out. There are no small orifices or hidden corners. Ultrasound is well known for its cleaning applications, such a surface, part cleaning. The ultrasonic intensity used for dispersing applications is much higher than for typical ultrasonic cleaning. When it comes to the cleaning of the wetted parts of the ultrasonic device, the ultrasonic power can be used to assist cleaning during flushing and rinsing, as the ultrasonic cavitation removes particles and liquid residues from the sonotrode and from the flow cell walls. Ask for more information on ultrasonic dispersing! Please use the form below, if you wish to request additional information about the dispersing by ultrasonication. We will be glad to offer you an ultrasonic system meeting your requirements.